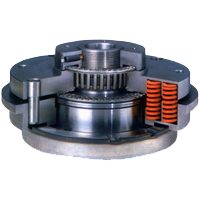 The LCS torque limiter is a completely mechanical device that serves to immediately cut the transmission of a torque when the torque demand exceeds the set value of the limiter. It is not a safety device. 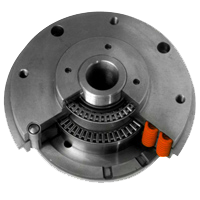 It serves to protect the mechanical parts placed between the motor and the limiter from the harmful consequences of both instantaneous and permanent overload. All moving parts of the limiters are guided by roller bearings and the torque transmission is guaranteed by a series of hardened and rectified rollers that are engaged in a hardened and rectified footprints track on the outskirts of the limiter to contain the specific stresses within very low values​​. It can operate equally in both directions. The calibration of the limiter is done through a series of high-flexibility, chrome-vanadium steel helical springs. It is thus ensured a high accuracy calibration and readiness of intervention even after a long time since its installation. 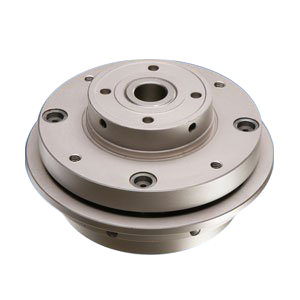 The disengagement of the limiter is detected by the axial movement of a movable plate that can be used to stop the driving part through a contact or proximity microswitch and to allow the removal of the overload. 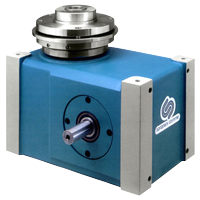 The couple left over after disengagement is usually less than 15% of torque setting. After eliminating the causes of disengagement, it is sufficient to rotate, clockwise or counterclockwise, the driven part and it shall re-insert in the only possible position on 360°, thus restoring the phase of the machine. Built mainly as an option for rotoblock® indexing units, it can be provided with on demand special keying. The Technical Department of SONZOGNI CAMME is available to study and recommend the type and implementation best suited to meet specific requirements.